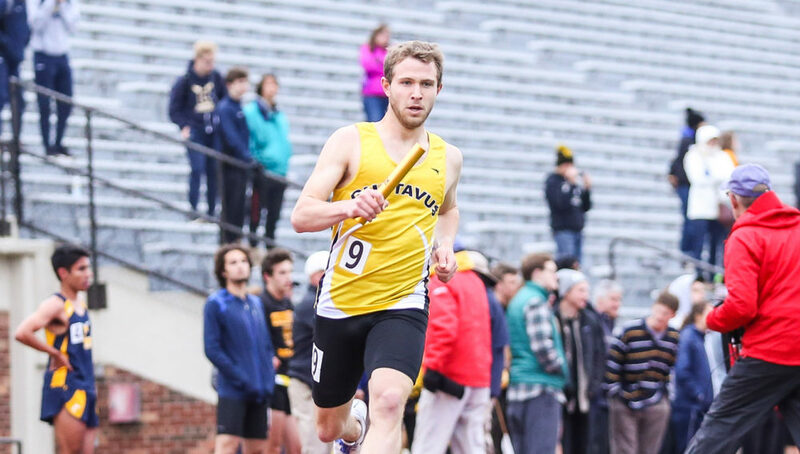 NORTHFIELD, Minn. – The Gustavus men’s track & field finished the second day of competition on Saturday at the 2018 Minnesota Intercollegiate Athletic Conference Outdoor Championships in seventh place of 11 teams with a total of 63 points. The Gusties scored 23 points during day one of competition and dropped from sixth place to seventh after day two while a pair of Gusties were All-Conference honorees with top-three finishes. The University of St. Thomas scored 198.5 points to take first place. “We got more points than we were predicted to get to it was good to see,” said Head Coach Dale Bahr. Taylor Rooney (Fy., Andover, Minn.) turned in the top finish for the Black and Gold, winning the 110-meter hurdles with a time of 14.69. He also was the runner-up in the high jump with a six foot, five inch leap. Michael Hensch (Jr., North Branch, Minn.) also headlined the team’s performance. He finished second in the discus throw with a personal best mark of 148-2 and finished third with a 181-2 hammer throw, combining for 14 points. Rounding out the individuals who scored points for Gustavus was Jeremy Gilbertson (Fy., Maple Grove, Minn.), who finished sixth in the 5,000-meter run with a time of 15:19.83. In addition, the 4×400-meter relay team of Bobby Verchota (So., Hastings, Minn.), Jack Blaney (Jr., Lake Elmo, Minn.), Ben Madigan (Jr., Kohler, Wis.), and Brennan Gustafson (Fy., Kasson, Minn.) finished fourth with a season-best time of 3:21.05.